The Theme is "Close Enough to Kiss" which I LOVE (that is one of my favorite things about babywearing, being able to easily kiss and sniff that sweet little baby head). 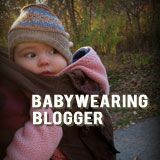 So put on your baby, kiss that little head, go out, and spread the babywearing love! !